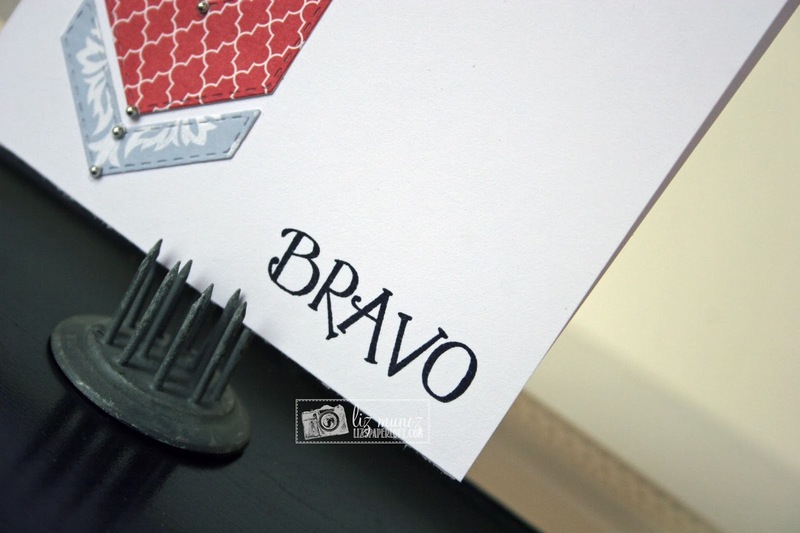 Liz's Paper Loft: MCT February Release Blog Hop ~ Bravo! Welcome to My Creative Time February Release Blog Hop! I'm so excited that it's Friday, I don't really have plans however I'm already starting my weekend! Now you know why I'm excited, oh and one more reason...you can now order anything from this release!!!! Let the shopping begin!!! You should arrived here from Miss Emily! If you just popped in to see me, then you'll want to head over to Miss Emma's for the start! I made this card for a friend of mine that just passed her RN test using the new "Stitched Chevy Dies" and "Fun Gift Pocket Sentiments Stamps"
I cut two stars out of different papers, then used a smaller star to cut the center out of one of them. I'm really happy with the look. It's a bit hard to see, I added tiny silver dots on each of the points. GORGEOUS!!!!!!!!!!!!!!!!!!!!! LOVE this Miss Liz! Thank you! This is fabulous!!! I love how you did the stars and those little silver dots are perfect!! Your card is gorgeous I love it so BRAVO 2 U!!! I just love how it not only looks vintage/shabby chic but patriotic too. Girl you really create magic with Miss Emma's goodies. YOU ROCK!! This is stunning!! I LOVE the colors and papers you used with the chevys, and the stars are the perfect touch. Wowie! Your have such talent! Love your blog and cards! These dies are great! 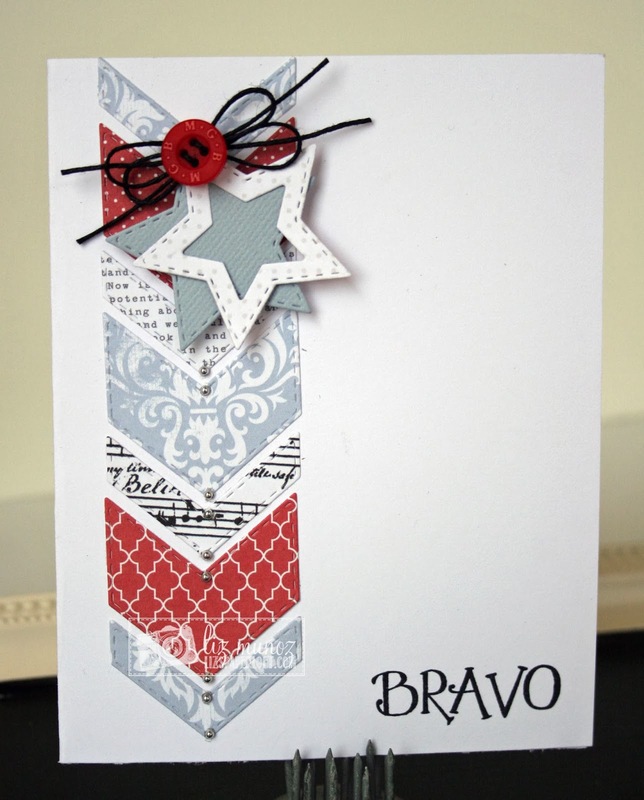 Love these cards and a great use of the new Chevron die! This is great...LOVING these new dies. Wonderful--I like your choice of papers. Wonderful Liz! Yay for your friend who passed her RN boards. Whew, that is a tough one. This card would be perfect for a service member too. Thanks for sharing with us! Have a GREAT weekend. This is so elegant - those chevron's might be a must have. I love it. Beautiful card. I like the papers and little embellishments down the center of each arrow. 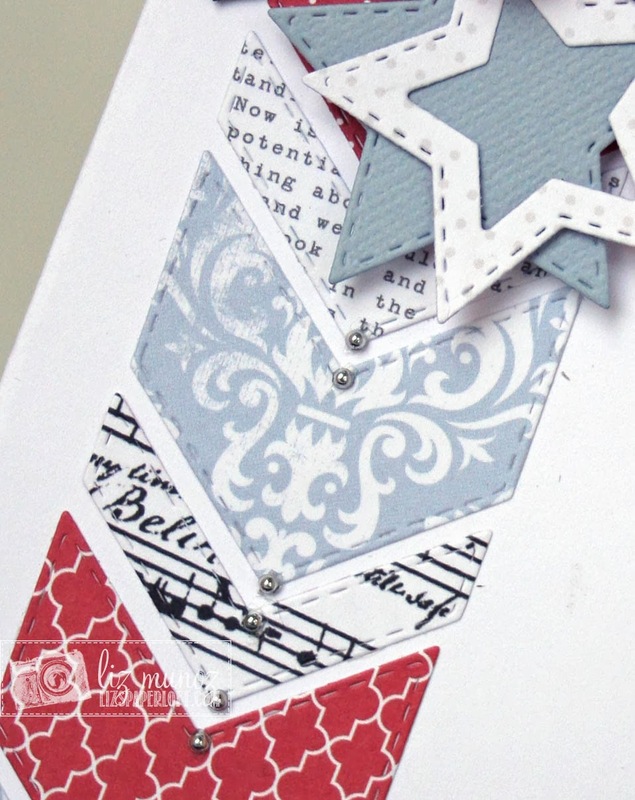 Love how you used the chevron dies on the front of this card and the papers and colors you put together. 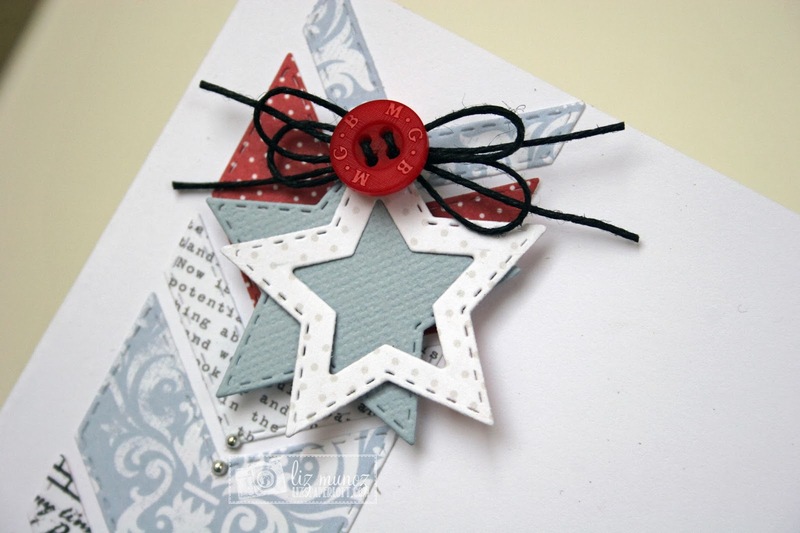 Awesome card..the way you used the chevy die is so fun-the papers are awesome and love the stars! Thanks for such a wonderful week of inspiration! love your paper choices for the chevrons. Beautifully done. Absolutely gorgeous! Love the colours! CAS and stunning! Beautiful card, I just love the pattern papers you used. Your card is so cute:) Love the papers you used and the way you used the Chevy die arrow. Very very cute! Love the design and the mix of papers! Great job! Your friend will adore this lovely card. So cute - love the stars and the button and twine. Nice looking card! Stars are great. TFS. Wow, thanks for sharing your beautiful project, you did a great job! Wonderful card! I really like the chevy dies, and the star added with them really adds that extra zing! BEAUTIFUL! Lucky friend to receive such a lovely creation. Love this design. 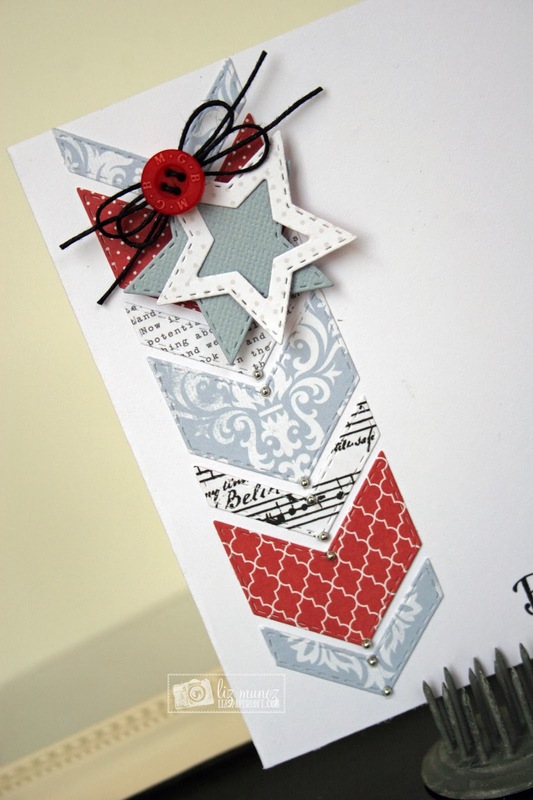 I love dies and these chevrons and stars are just perfect. This is gorgeous Liz!!! I love the pattern papers you used! Beautiful card. Love the paper you used. Great little tag! Love the chevron die and the stars you used on it. Thanks for sharing a great idea with us. Beautiful card! Congrats to your friend on her accomplishment! Awesome Card and Great Design. Oh LIZ ~ this is GORGEOUS! I LOVE how CAS it is, the paper you sued and the subtle details! BEAUTIFULLY done as always! Stunning CAS card Liz, love the colors you used! I really like your star layers and the simple sentiment and button and bow. Fabulous job on a beautiful card. love how your card turned out! Bravo!